The phase III SOLD trial failed to demonstrate that disease-free survival (DFS) with 9 weeks of adjuvant trastuzumab (Herceptin) was noninferior to the standard 12 months when the 2 regimens were combined with chemotherapy in women with early stage HER2-positive breast cancer. The 5-year estimated DFS rate was 90.5% with 1 year of trastuzumab versus 88.0% with 9 weeks (HR, 1.39; 90% CI, 1.12-1.72). The 5-year estimated overall survival (OS) rates were 95.9% versus 94.7%, respectively, (HR, 1.36; 90% CI, 0.98-1.89). The estimated 5-year rate of patients without distant recurrence (distant-free survival) was also higher with longer trastuzumab at 94.2% compared with 93.2%, respectively (HR, 1.24; 90% CI, 0.93-1.65). 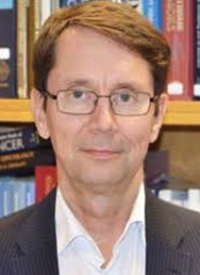 “Chemotherapy plus 1-year of anti-HER2 therapy should remain the standard based on the SOLD results,” lead investigator Heikki Joensuu, MD, professor in the Department of Oncology at the Helsinki University Hospital and University of Helsinki in Finland, said at press conference during the 2017 San Antonio Breast Cancer Symposium. Joensuu also noted that a subgroup analyses demonstrated a significant interaction (P = .007) between the dose of docetaxel administered concomitantly with trastuzumab, with improved DFS observed in patients receiving a higher dose. Thus, it may be possible that for patients receiving 100 mg/m2 versus 80 mg/m2 of docetaxel, 9 weeks of trastuzumab is sufficient. The SOLD trial, which was conducted at 65 centers in 7 countries, accrued 2176 patients with early-stage HER2-positive breast cancer between Jan 3, 2008, and December 16, 2014. The 9-week arm included 1085 patients and 1089 patients were randomized to 1-year of trastuzumab. Patients had histologically confirmed HER2-positive breast cancer, a WHO performance status of 0 or 1, and left ventricular ejection fraction ≥50%. Patient characteristics were well balanced between the arms. The median age across both arms was 56, 33% of patients were premenopausal, 92% had ductal histological disease type, two-thirds of patients were ER-positive, and about 47% were PR-positive. Sixty percent of patients across the trial were axillary node negative, about 30% had 1 to 3 positive nodes, and about 10% had more than 3 positive nodes. Breast tumor diameter was ≤10 mm in 13% of patients, 11 to 21 mm in 43% of patients, 21 to 50 mm in about 41% of patients, and >50 mm in 3% of patients. In both arms, patients received 3 cycles of docetaxel (80 mg/m2 or 100 mg/m2) and trastuzumab, followed by 3 cycles of FEC chemotherapy (5-FU, epirubicin, and cyclophosphamide). After this initial phase, patients in the 9-week arm received no additional treatment, while trastuzumab was administered every 3 weeks for 14 cycles for patients in the 12-month arm. Guideline-appropriate radiation therapy and endocrine treatment was administered to ER-positive patients. The data collection cutoff date was December 31, 2016, and the median follow-up time was 5.2 years. In the 80 mg/m2 docetaxel cohort, the estimated 5-year DFS rate was 91.3% in the 12-month arm versus 86.8% in the 9-week arm (HR, 1.66; 90% CI, 1.30-2.11). However, in patients received 100 mg/m2 of docetaxel, the estimated 5-year DFS rates were 92.2% in the shorter trastuzumab arm versus 87.8% in the longer trastuzumab arm (HR, 0.71; 90% CI, 0.44-1.14). “Docetaxel dosing with trastuzumab requires further study,” said Joensuu. He also hypothesized that there could be an immunological basis for the outcome discrepancy with the docetaxel dose variance. Regarding safety, there was less cardiac toxicity with the shorter trastuzumab regimen. In the 9-week group there were 22 protocol-defined cardiac adverse events compared with 42 in patients receiving 1 year of trastuzumab (P = .012). Congestive heart failure occurred in 21 and 36 patients in the 2 arms, respectively (P = .046). Joensuu H, Fraser J, Wildiers H, et al. A randomized phase III study of adjuvant trastuzumab for a duration of 9 weeks versus 1 year, combined with adjuvant taxane-anthracycline chemotherapy, for early HER2-positive breast cancer. The Synergism Or Long Duration (SOLD) trial. Presented at: 2017 San Antonio Breast Cancer Symposium; December 5-9, 2017; San Antonio, TX. Abstract GS3-04.